Codel provides an immutable audit trail and series of applications for users to protect and control data, to prove its integrity and validity and to notify users where to find updated content. 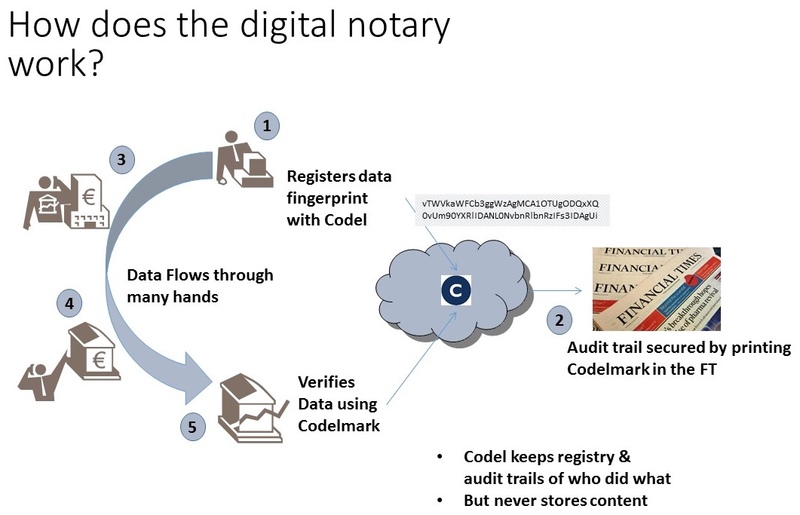 Codel proves authenticity for any type of digital data (published documents, identity information to know your customer, images, video, music, spreadsheets etc.) and is used for financial services, protecting intellectual property, records management and supply chain tracking. Proving the authenticity of data has never been so important. Adherence to compliance requirements has made many organisations reassess how they prove the authenticity of audit trails, documents and other digital records. Codel is an innovative, simple and inexpensive technology designed to help organisations address their data authenticity needs. Codel can be used on its own or in combination with distributed ledger technology such as Blockchain.